Each year the American Library Association publishes a list of the most frequently challenged books of the previous year. So why not choose a book from the most recent year's list? In 2014, there were some excellent choices that were challenged or banned: The Absolutely True Diary of a Part-Time Indian by Sherman Alexie, The Bluest Eye by Toni Morrison, and The Kite Runner by Khaled Hosseini are all great choices that appear on the list. It's amazing how many classics have been challenged over the years. I suppose this is because they are more often assigned to classes and therefore have more of an opportunity to be challenged. 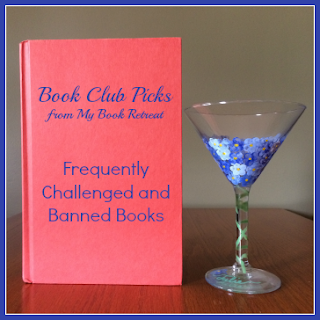 If your book club is up for reading a classic, check out the many classics on the frequently challenged list, including: The Catcher in the Rye by JD Salinger, The Grapes of Wrath by John Steinbeck, To Kill a Mockingbird by Harper Lee and Animal Farm by George Orwell. Memoirs seem to be popular in book clubs; I know my group has read a few. Authors of memoirs tend to share their own personal opinions and experiences, which may go against others' beliefs and can lead to challenges. If your book club enjoys memoirs, check out The Glass Castle by Jeannette Walls, Persepolis by Marjane Satrapi, or I Know Why the Caged Bird Sings by Maya Angelo. You could also try the new release My Fight/Your Fight by Rhonda Rousey. Evidently it's been banned by Walmart. What are your favorite banned books? Do you have any that you'd recommend for book clubs to discuss? Please let me know if you have suggestions for other topics to cover, or if you would like to write a guest post for my Book Club Picks series. I'd love to hear about your book club or your favorite books for discussion! Don't miss another edition of Book Club Picks! Great choices, Julie! I have read many of these and enjoyed them all. In fact, I read I Know Why the Caged Bird Sings and Persepolis both for Banned Books Week (different years). With difficult subject matter and controversies, banned books automatically make for some good discussions!